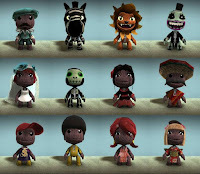 This is the first of four posts I will be writing on LittleBigPlanet. I have been playing the game since its release day, gathering and refining my thoughts on it. I have been somewhat surprised by the lack of discussion on what I confidently call the PS3's premier game, so I encourage everyone to jump in! LBP is billed as a game centered on creation. The game's intro sets the tone, describing people's brains as "charged with creative energy," just waiting to be set free. Of course, there is merit to this characterization, but it only partially illuminates the genius of LBP. As eye-catching as the construction of levels and of characters is, I argue that the game's subtle emphasis on deconstruction is one of its most important features. In order to comprehend the world of LBP, the player must first break down the game's elements. Successful creation necessitates an understanding of Sackboy's abilities and his relationship to his material world (the levels). LBP is unique in comparison to other high profile games platformers: rather than hiding its pieces and their interactions, the player can see the game's guts. This serves to augment both the game's charm, and the player's understanding of how video games function. I have been playing LBP for over a month, and have seen a dizzying variety of character models. However, regardless of clothing choices or accessories, they all play the identically. Every player must navigate the levels through some combination of running, jumping, and grabbing. I characterize Sackboy's move set as mundane, but not in a pejorative way; the game strips away the complication of many 2D platform avatars, forcing the player to think about the nature of platforming games. Sackboy interacts with the environment with in a directly physical way. Lacking tools such as whips, super missiles, and tanooki suits, Sackboy must traverse the world by utilizing his three innate abilities: running, jumping, and swinging. Tools are products of the manipulation of the environment itself, rather than the utilization of a device acting upon the level. I have played levels where Sackboy utilizes swords, horses, and keys, and all of these items were clever iterations of jumping and grabbing. Take the modern video game character, strip away their gadgets and power-ups, and one derives Sackboy. Dress him up in countless ways, but Sackboy remains the archetypal platformer character. He illustrates the essence of 2D platforming and makes LBP a model of the fundamental mechanics of countless games. LBP's level designer pushes the game beyond what is basically a fun scavenger hunt. Even if a player never makes a complete, working level, the creative tools allow for experimentation that transforms the game into a gigantic design lesson. On my first play-through of LBP, I was charmed by the levels' enchanting aesthetics and ingenious constructions. Knowing that objects found in the story mode would aid in level creation, I decided to play through the entire game before delving too deep into my own levels. After completing the story, I started tinkering with the level creator. A few hours of experimentation inspired me to go back and play through all the levels again, from start to finish. The level creator drops the player into a blank canvass under their complete control. Very little is handed out freely, thus the player must gain a deep understanding of the game's mechanics in order to create functional levels. Platforms will not simply float in the air at Sackboy's precise jumping height; they must be rigged up carefully and tested. Terrain and obstacles must be formed and placed deliberately within the game engine's multi-layered backgrounds. Even the game's camera angle, color tint, and musical arrangement is under the player's control. The most impressive thing in all of this is realizing that all of the levels in story mode were created with the same tools and items available in the creation mode. This altered my view of the developer levels: I began to see them simultaneously as a collection of interlocking parts and as a seamless entity. Now when I swing across a chasm, I take note of the material the swing's handle is made of, the angle of the ceiling beam the bolt is attached to, and the height of the two platforms I am traversing. LBP is a game that grows more rewarding the more I break it down. Examining each part's role in forming a larger experience heightens the game's allure. 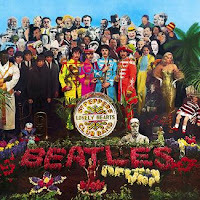 While imperfect, I find myself coming back to musical metaphors when trying to wrap my head around LBP. 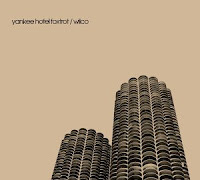 My current favorite: Super Mario Bros. 3 is to the Beatles' Sgt Pepper's Lonely Hearts Club band as LBP is to Wilco's Yankee Hotel Foxtrot. Both games and albums are magical achievements, but in very different ways. One pair charms us by presenting a sweeping vision that conveys a sense of effortless art while the other displays the noise, minutiae, and the sweat that went into building the grand work. LBP works as a traditional sidescroller, but its real power lies in its deconstructive abilities. Sackboy's essentialist nature and the meticulously designed levels that can easily be parsed into their individual parts make this a game about more than platforms. LBP cultivates the player's critical eye, allowing them to revisit old games to deconstruct their elements, marvel at their creativity, and understand how a game's pieces interact to create something larger than the sum of its parts. As I've just recently started getting into the design aspect of the game, I'm already floored by how altered my perception is of the game . . . and I've done is the basic tutorials of design. Anyway, I look forward to your other three posts concerning LBP. A lot of bloggers are commenting about their surprise at the lack of LBP coverage, but I think they're not looking in the right places. People are talking about LBP all around the net including me. I've been writing about LBP since before the game released. So far I have a 4 part review (http://critical-gaming.squarespace.com/blog/2008/11/6/littlebigplanet-review-and-repair-pt1.html) workshops, design lessons, and levels. I'm surprised that many are spending so much mental energy on trying to figure out what LBP is about. It's simple. Play. Create. Share. That's it. As much as LBP's creator lends itself to a sort of x-ray view into how everything works, it's also possible to conceal these "guts." Though the single player levels are highly polished providing an excellent model for aspiring creators, the problems at LBP's core run deep. to understand LBP's PLAY & CREATE portions is to understand game design. Mechanics, influences, variation, level design, camera design, etc. I hope to see more specific comments, thoughts, and coverage in your later segments. You've stumbled upon the real reason I do this blog with Scott. It's an excuse to go over and get my hands all over his PS3.